« Oh Craig, where are you when I need you? 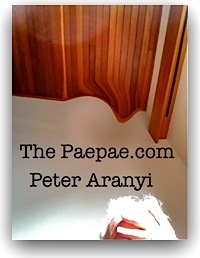 Reputations — good and bad — are a topic we discuss here at thePaepae.com from time to time. I’m interested in hearing what you think about it (…if anything). Newspapers used to turn into fish and chip paper or crumble to dust... what do old blogs do? Watching the chickens coming home to roost on some of the spruikers who grace these pages from time to time, I can’t help but be struck by the natural consequences (‘just desserts’?) of a ‘bad’ track record or reputation. We each gain the reputation we deserve, eventually. ‘Reputation is built up over time. It can be built up negatively and positively’ said researcher Danah Boyd in response to Google’s Eric Schmidt’s (half-serious?) suggestion that changing your name would be the only way to distance yourself from your past. While it can seem harsh seeing the hate campaigns that kick in sometimes against the public face of fallen businesses like failed finance companies, there is an element of ‘enforcing norms’ — and a deserved loss of reputation is part of that process. 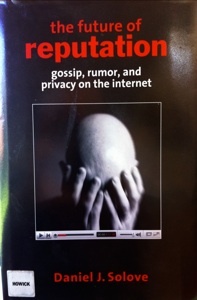 I’ve just finished reading Daniel Solove’s book The Future of Reputation, which in part examines what he described as ‘the death and rebirth of shaming punishments’ — ‘internet shaming‘. Solove offers the thought that the internet is, in some ways, the modern equivalent of ye olde village stocks — where wrongdoers and those who breached society’s norms found themselves labelled, mocked, chastised and pilloried for their sins/actions against the community. 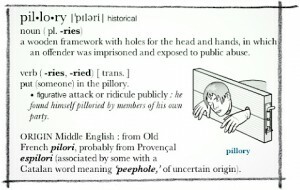 (The very word pillory coming from the equipment used). Internet shaming creates an indelible blemish on a person’s identity. Being shamed in cyberspace is akin to being marked for life. … People acquire permanent digital baggage. They are unable to escape their past, which is forever etched into Google’s memory. Well, hang on. That lines up with Schmidt, but seems a little dramatic. I discussed in my post Giving scumbags a second chance how sometimes the reputational damage to crooks and ratbags can actually be incomplete and short-lived — sometimes even suppressed, thus giving them the chance to, goddammit, learn the wrong ‘lessons’ from their mistakes, increase their crooked competence and get a second, more-refined, chance to ruin people’s lives. Sometimes they move to a new location to achieve that. I personally try to steer clear of abuse and ‘condemnation’ of others. (Yeah, OK… ‘scumbag’. You got me.) I try to focus on their actions and claims, not their soul. There’s a distinction Solove discusses between ‘You have committed a bad act’ and ‘You are a defective type of person’. And I eschew invasions of privacy. I am, however, when necessary, willing to name names. I do, and I will raise concerns, or pass comment (harshly where necessary) on ludicrous marketing claims or what I see as misleading behaviour by spruikers and others — actions which sometimes fall into the just-how-stupid-do-you-think-we-are? category. Liars earn our disrespect, I think. Is that internet shaming? Yeah? Well, OK. Sadly, the adage: ‘There’s a sucker born every minute’ is surprisingly apt, a lot of the time. In my view (not just mine, clearly) the internet IS the future of reputation. Some of the news media articles about ratbags and scumbags deserve to follow them forever and that seems fair enough. Damn right. … and making removal of ‘negative’ feedback from the web ( … including but not limited to internet blogs … ) part of their demands for the wispy promise of a refund to dissatisfied customers. Did you see that Eric Schmidt, while Google CEO, tried to get Google’s boffins to obscure his past political donations from the search engine results? That’s questionable if you ask me — and especially ironic given his ‘change your name’ advice… which is plain silly. …even when folks have a negative reputation, they often don’t want to lose the positive reputation that they’ve built. Starting at zero can be a lot harder than starting with a mixed record. Most people who have bruises on their public reputation also have gold stars. Just look at various infamous people who have had their names dragged through the mud by the press. Many have been invited to change their names but few have. Why? Because it’s more complicated than a simple name change. Dishonestly defending your reputation is ‘not OK’. … and BTW denigrated me for daring to suggest that perhaps a Richmastery leopard doesn’t change its spots. 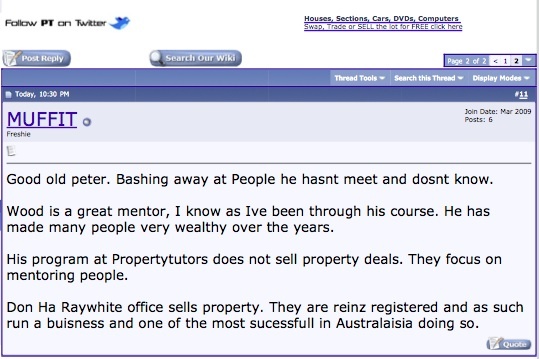 It transpired that MUFFIT was actually a pseudonym for Sean Wood — so he was, err … anonymously recommending himself. Er, tacky. It seems to me that dishonestly defending one’s reputation in this way is a step too far. I personally see that as indicator of character. 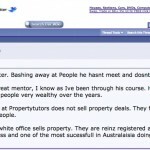 Someone contacted me in response to my earlier post Thoughts about authenticity — and in passing, vouched for Sean Wood telling me he’s not the sharpest knife in the drawer (or words to that effect) especially when it comes to using the internet, but that he is an honest businessman, and that he doesn’t, as I have perhaps implied, mix property sales with his ‘education’ … well, not anymore, they said. As Jon Stewart said in his interview with Rachel Maddow: “We have a tendency to grant amnesty to people we agree with, and be dismissive of people we don’t…”. Love this, Peter, especially your Oscar Wilde quote!